An ankle bone discovered in central Burma could be evidence of an ancient ancestor common to many of today's primates, including humans. The 45-million-year-old fossil has features that link it to all of the anthropoids, the grouping of human-like species such as apes and monkeys. If correct, this would tie their line of evolutionary descent to Asia and not Africa as some have suggested. The PNAS journal presents a paper on the discovery by Laurent Marivaux, of the University of Montpellier II, and colleagues. They say the way the left tarsal bone might have moved in the joint would have been typical of known, early anthropoids, which clambered about in trees. They even speculate that the remains may have belonged to an anthropoid species known as Amphipithecus, a large, ape-like animal. The implication of the team's research is that humans' primate ancestor may have had Asian origins. The PNAS report suggests the Burma descendents would have moved into what is Africa before evolving into the various human species that then spread back out across the globe in the last few hundred thousand years. Researchers working in southern Asia have discovered 40-million-year-old fossil teeth and jaw fragments that, in their view, support the controversial notion that anthropoids originated in Asia. The find in Myanmar represents a new species, Bahinia pondaungensis, in the anthropoid group, which includes monkeys, apes, and humans, reports a team led by anthropologist Jean-Jacques Jaeger of Université Montpellier-II in France. The teeth show key similarities to those of Eosimias, a 45-million-year-old fossil creature from China that may also have been an early anthropoid (SN: 11/11/95, p. 309). "The Bahinia find tells us that there was a complex community of primates living in Asia, with a tremendous anthropoid radiation much earlier than [many scientists] thought," Jaeger holds. As with the Chinese material, however, classifying Bahinia as an anthropoid proves controversial. Critics say that Jaeger?s group lacks sufficient skeletal evidence to justify its conclusion. In contrast to the recent Asian finds, excavations over the past 40 years in Africa?especially at a rich Egyptian site?have uncovered extensive evidence of anthropoids dating to 36 million years ago (SN: 7/1/95, p. 6). Africa, the birthplace of the human evolutionary family, has received much mention as the possible ancestral home of anthropoids. Jaeger and his coworkers view their new find as evidence for a much earlier origin of anthropoids in Asia, perhaps 55 million to 60 million years ago. In November 1998, the researchers recovered two fragmentary upper jaws and a broken lower jaw, each retaining a number of teeth, belonging to Bahinia. The same excavation level yielded the lower jaw of a previously identified species known as Amphipithecus. Jaeger?s group views Amphipithecus as a more anatomically advanced anthropoid that lived at the same time as Bahinia. Bahinia?s teeth exhibit a unique combination of anthropoid features along with traits of more primitive, tarsierlike primates from nearly 60 million years ago, the researchers report in the Oct. 15 Science. Compared with Amphipithecus, Bahinia resembles a "living fossil," they contend. Bahinia?s teeth look enough like those of Eosimias, to place both creatures in the same evolutionary family, which may have been a sister group of the family that includes Amphipithecus, Jaeger?s group says. Bahinia?s dental anatomy adds further support to the view that Asian anthropoids developed from creatures related to modern tarsiers, the team adds. "The Bahinia fossil is closely related to Eosimias," comments paleontologist K. Christopher Beard of the Carnegie Museum of Natural History in Pittsburgh. "This reinforces the view that anthropoids originated in Asia." Beard directs ongoing excavations of Eosimias remains in China. Elwyn L. Simons, an anthropologist at Duke University in Durham, N.C., views such assertions as premature. "Neither the Bahinia nor the Eosimias finds are complete enough to show critical anatomical features of anthropoids," says Simons, who directs primate excavations at an Egyptian site. "The case for anthropoid origins in Asia is as shaky as ever." For instance, because no skulls are available for the Asian creatures, it?s impossible to know if they had a fused forehead bone and a closed bony plate in the eye sockets, features characteristic of all anthropoids, Simons holds. The same anatomical uncertainties apply to Amphipithecus, he adds. Beard and his coworkers, however, have discovered fossil limb bones from Eosimias, including parts of the lower leg and ankle, that, they argue, exhibit features found only in anthropoids. Even if further discoveries confirm the anthropoid status of the Asian creatures, Simons remarks, no fossil evidence indicates that anthropoids later spread through Asia and founded African populations. Forty million year old fossil teeth and jaw fragments from a new species of early primate found in Myanmar lend support to the idea that the ancestor of all monkeys and apes lived in Asia instead of Africa. The new species, dubbed Bahinia pondaungensis in the 15 October issue of Science, may also shed light on what kind of primate was the likely predecessor to this monkey/ape group. Researchers from the Myanmar-French Pondaung Expedition Project, led by Dr. Jean-Jacques Jaeger of the Université Montpellier-II in France, discovered the Bahinia fossil in a layer of red clay, along with a complete lower jaw from a more advanced primate called Amphipithecus. According to Jaeger and his colleagues, both Amphipithecus and Bahinia belong to the primate group called the anthropoids, which includes all fossil and living monkeys and apes. Anthropoids are distinguished from more primitive-looking types of primates like lemurs (and their extinct relatives) by a number of anatomical features. The research group hopes that their scientific detective work involving Bahinia will help them solve a long-standing mystery in primate paleontology: where, when and from whom did the earliest anthropoids come from? Many early anthropoids have been found in Africa, most of them in Egypt where a site called the Fayum has yielded a dizzyingly complex variety of primate species. This fueled scientific speculation that Africa, already known as the cradle of human origins, was the ancestral home of anthropoids as well. In recent years however, Asian anthropoids have begun to join the fossil ranks, with discoveries from Thailand, China, and Myanmar. The Asian fossils range in age from the Middle to Late Eocene (49-33 million years ago), and include some of the most primitive-looking anthropoids ever found. One species in particular, a tiny Chinese primate named Eosimias, is so primitive-looking that some scientists doubt whether it was even advanced enough to be called an anthropoid. The Pondaung Expedition team re-opened the investigation of anthropoid origins after taking a closer look at the details of Bahinia's dentition. To begin with, they found a strong resemblance between Bahinia's teeth and the teeth of Eosimias, so much so that they decided to place Bahinia in the same family as Eosimias. "Bahinia is important because it is a much more complete fossil than Eosimias," said Jaeger. "With the additional fossil material, we were able to look at more dental characters, and these extra characters in the Bahinia fossil helped us to confirm that Eosimias is definitely an anthropoid." Together, Bahinia and Eosimias are the most primitive anthropoids ever uncovered, and both of these species are only found in Asia. Jaeger and his colleagues think that this is good evidence, along with some of the other Asian fossil finds, to support the claim that anthropoids may have originated on that continent. This could mean that anthropoids migrated from Asia to Africa at some point, but so far there isn't much concrete evidence to support this part of the tale, Jaeger said. Another intriguing aspect of Bahinia's telltale teeth suggests that anthropoids may have originated much earlier than scientists have thought. The new fossil's teeth display a combination of anthropoid features and traits seen in older, less advanced primates. This makes Bahinia look like a living fossil. "Bahinia is a 40 million year old fossil that looks like a 57 million year old fossil in its teeth," said Jaeger. "What makes this interesting is that it appears in the fossil record at the same time as a much more advanced anthropoid, Amphipithecus. It's like having your ancestors live along side you." The mix of old and new in Bahinia could mean that the anthropoid group has its roots stretching far back into time, possibly even into the late Paleocene (58-55 million years ago). Pinpointing the anthropoid ancestor's arrival on the evolutionary scene is important, but it doesn't quite solve the mystery of the ancestor's identity, lurking somewhere in the shadowy forests of the time. Jaeger and his colleagues feel that the Bahinia fossil offers clues to answer this question as well. Primate fossils from the Paleocene and the Eocene generally fall into three main families: a group of animals called adapids, another group called omomyids, and a third group called the tarsiids. Adapids and omomyids may have been similar to today's lemurs and lorises. The tarsiids are represented today by one genus, Tarsius, a nocturnal primate from Southeast Asia that appears to be intermediate between primates like omomyids and primates like monkeys and apes, including humans. At one time or another, scientists have suggested each of these primate groups as a likely candidate for giving rise to anthropoids. Adapids, omomyids and tarsiids are still vying for the title of closest relative, as the debate continues with the addition of new fossils and even genetic data from possible descendents of the three groups. After comparing Bahinia's dental anatomy with fossils from each of the three groups, the researchers believe that Bahinia is most similar to tarsiers. They consider this strong support for a tarsiid origin for anthropoids. "But more fossils, including the skull and ear bones, will be necessary to definitely solve the problem," Jaeger said. "That's why we're going back to Myanmar at the end of the year." By primate standards, Bahinia was a small animal. The researchers estimated its size to be about 400 grams, somewhere around the size of the smallest South American monkeys. These earliest anthropoids were tree-dwellers, and the shape of their teeth, along with their small size, suggest that Bahinia probably ate mostly insects, like its sister species Eosimias. "The Bahinia find is important because it tells us that there was a complex community of primates living in Asia, a tremendous anthropoid radiation much earlier than anyone thought," said Jaeger. "We didn't have that kind of information about Asia before, only Africa. Now we may have to change our whole story about anthropoid origins and evolution." Last edited by Triglav; Saturday, April 17th, 2004 at 11:01 PM. Yangon, 16 Dec - A study group comprising French palaeontologists Dr Jean Sudre, Dr Stephane Docrocq, Dr Bernard Marandat, Dr Laurent Marivaux and Thai paleontologist Dr Yaowalak Chaimanee led by French paleontologist Professor Dr Jean Jacques Jaeger arrived in Myanmar on 13 November to study fossils in Pondaung in November and December. The study group, in cooperation with the Pondaung region fossil exploration and study group jointly formed by the Ministry of Defence and the Ministry of Education, went on field trip in the environs of the villages in Myaing Township, Pale Township and Kantbalu Township from 14 November to 15 December. It is the fifth time Myanmar and French palaeontologists have jointly conducted fossil exploration work since April 1998. 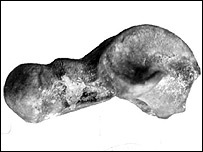 Two right mandible bones of Bahinia Pondaungensis and Pondaungia Cotteri have been found, which have been acknowledged as those of the earliest Anthropoid primate by the palaeontologists. While exploration work was being done near Paukkhaung on 18 and 20 November, Molar No 1 of Pondaungia primate and a canine tooth of primate which has been assumed to be Myanmarpithecus were found at a place about two miles north-west of Paukkhaung. In 1 December, the combined team explored the environs of Moegaung Village in Pale Township, the root of Molar No 4, a fragment of the left mandible containing Molar No 1 and Molar No 1 of Pondaungia primate were discovered at Lema. As they have significant features, they are of great help to research work. On addition, upper molars and lower molars of a new species of the insectivore, and the jawbones and teeth of a new species of the mammal, the rhinoceros, the chamois, the carnivorous and the crocodile. The Myanmar-French fossil exploration team also found jawbones, teeth and fossilized remains of the elephant, the rhinoceros, the fish, the turtle and the crocodile in the environs of Chaungtha Village in Kantbalu Township on 5 December. The French palaeontologists left here yesterday evening after finishing their research work for 2001. Yangon, 11 Dec - Prof Dr Jean Jacques Jaeger of the Universite de Montpellier II of France, led the paleontologist group comprising Dr Stephane Ducrocq, Dr Bernard Marandat, Dr Jean Sudre, Dr Laurent Marivaux and Dr Yaowalak Chaimanee and arrived in Yangon on 29 October. The paleontologist team from France together with Myanmar paleontologists from the Ministry of Defence and the Ministry of Education set out a mission to explore fossil remains of primates and research works at the vicinity of Bahin Village in Myaing Township in Magway Division, Mokaung Village in Pale Township and Male Village and Chaungtha Village in Kanbalu Township, Sagaing Division, from 29 October to 28 November. Myanmar and French paleontologists have cooperatively launched altogether six field studies in Pondaung region since 1998 and due to these field researches, fossils of the oldest primates, Bahinia primate, were discovered in Myanmar and success has been achieved in research works. This year, during the field research, left lower jaw with molar 1 and 2 of Myanmar Pithicus primate was discovered near Paukkhaung Kyit Chaung No 3 (estimated map-G 486426) on 3 November, left lower jaw with molar 1 and 2 of Pondaungia primate near Paukkhaung Kyit Chaung No 1 (estimated map- J 915435) handed over by U Shwe of Htanaungon Village on 6 November. A left ankle of Anthropoid primate and a front tooth of primate, which is supposed to be a mammal, were found at Hsonta Kyit Chaung (estimated map- J 832649) near Mokaung Village in Pale Township on 18 November. The combined group also founded jaw, molars and teeth of ancient rhino, pig, mountain goat and tapir, pieces of bone and parts of skull of mammals and carnivorus, bone fossils, upper jaw and pieces of fossils of ancient animal which is of the same species of rat, squirrels and rabbit. The Myanmar-French paleontologist group cleansed and observed the primate remains and fossils at the National Museum starting from 30 November. They also made researches and pseudo-fossils. The French paleontologists left for home on 10 December. Yangon, 8 Dec - A Japanese palaeontologist team led by Professor of Primate Research Institute of Kyoto University of Japan Dr Nobu Oshige Hara arrived here on 1 November to conduct a fossil exploration and study in Pondaung region. The members of the team are Dr Masana Yutakai, Dr Noroko Eggi, Dr Hisashi Suzuki and Dr Takihisa Subamoto. The Japanese team, together with the Pondaung region fossil exploration team formed by the Ministry of Defence and the Ministry of Education, explored and studied fossils, and conducted the measuring of Stratigraphic Section of the Pondaung Formation in the environs of Bahin village, Hsinswe village and Makyikan village in Myaing township and of Gwebin village in Seikphyu Township, Magway Division, from 3 November to 4 December. Fossil studies including the present one have been carried out five times by Myanmar and Japan palaeontologists since 1998. There are important finds, and they are encouraging. This year exploration work was centred in Bahin village, Myaing township, and carried out in the environs of Paukkhaung village. On 9 November, Amphipithicus' left mandible with the premolars and molars was found near Paukkhaung. Its size is smaller than the one found by the Myanmar Pondaung region fossil exploration team in 1997. On 12 November, the Myanmar-Japan fossil exploration team found fragments of the right and left mandibles of Primate which can be assumed to be Eosimias near Paukkhaung. The fragment of the left mandible has only the roots of molars. The fragment of the right mandible has only Molar No 3. The fossilized fragments of the primate of the similar type were found in Jiangsu and Shansi provinces in China. The Eosimias found in Pondaung is a little bigger than that from China. The Eosimias found in China has a straight gum on the lower jaw bone while the Eosimias from Pondaung has a slightly curved gum on the lower jaw bone. The rear part of the mandible of the Eosimias from Pondaung is larger than that from China. The Eosimias from Pondaung is assumed to be a new species or new genus. The joint fossil exploration team also found the jaw , teeth and bones of the rhinoceros, the left and right jaws and molars of the swine, the teeth of the chamois, the teeth of the carnivorous, the jaw and teeth of the fish, the jaw and teeth of the crocodile and the shells of the turtle. In addition, the team measured the Stratigraphic Section of the Pondaung Formation, and studied the Stratigraphic relation between the rock formations of Pondaung and Yaw, the Ayeyawady rock formation in Seikphyu township and Yenangyoung township and fossils which were found from the Ayeyawady rock formation. In Pondaung region of Myanmar, primates such as Bahinia, Myanmar Phipithecus, Amphipithecus and Pondaungia were found. International palaeontologists have acknowledged them as the earliest primates. The newly-found Eosimias is the smallest primate in the world, and it has only a few characteristics of highly-developed primates and many characteristics of the earliest primates. Now in Myanmar, primates ranging from the earliest and smallest ones to highly-developed ones have been found. Yangon, 2 Dec - Prof Dr Nobuo Shigehara of the Primate Research Institute of Japan led the group comprising Dr Masa Nayu Takai, Dr Noroco Edgi and Dr Takihisa Subamo and arrived here on 1 November. The Japanese team together with Myanmar Paleontologists from the Ministry of Defence and the Ministry of Education set out a mission to explore fossils of Primates at the vicinity of Bahin Village, Paukkaung Village and Magyeekan Village in Myaing Township in Magway Division, Gwaybin Village in Seikphyu Township, Hsupyitsan Village in Magway Township from 3 to 22 November. Myanmar and Japanese Paleontolo-gists have jointly launched altogether six field studies including this one in Pondaung region since 1998 and due to these field researches, fossils of the oldest primates were discovered in Myanmar and success has been achieved in research works. This year, during the field research, right upper jaw with molar Nos 1 and 2 of Pondaungia was found near Ayoedaw-pon Kyit Chaung (estimated -J 937423) on 18 November. The size of the right upper jaw was smaller than the upper jaw and molars of Pondaungia discovered by Myanmar-Japan Paleonto-logist Group in Taungnikyin Kyit Chaung in Magyeekan Village in 1998. At that time, the combined group also found teeth and molars of ancient pig, pieces of bone and molars of rhinoceros, pieces of bone and parts of skull of mammals, bones, jaw and teeth of fish, teeth, pieces of jaw and bone of crocodile, pieces of shell of tortoise, pieces of bone of reptiles, parts of jaw of carnivores, leaf fossils, teeth of goat, pieces of bones of rat, squirrels and rabbit, a part of skull with upper jaw and molars of hippopotamus, jaw, molars, piece of bone of elephant and pig and buffalo. The group also measured Stratigraphic Section of the Pondaung Formation in Seikphyu and Yenangyoung townships, explored fossils near Hsupyitsan Village, Thityakauk in Magway Division and observed fossils at the Geology Department at Magway University. The Myanmar-Japan Paleontologists cleansed and observed the primate remains and fossils at the National Museum starting from 23 November. They also made researches and pseudo-fossil. The Japanese Paleontologists left for home on 30 November.